Betty Who resharing an older live performance to make sure everyone sees it. When it comes to social media, content is king and should be thought of as a highly valuable asset. Creating content takes time and effort, and you want to get as much out of it as possible. For bands and artists, there is often a lot more content created in what you are doing already – songs, music videos, live recordings, photos (both promo and live), merchandise, blog posts, and so much more – but using all of this to its fullest potential can be tricky. While some advocate against it, something I always suggest to bands, artists, and even companies is sharing already used content from a while back. I’ve heard people say it’s tacky and feels forced, but there are so many ways to do it well, and there are a number of great reasons why resharing content can be a good practice. Just because something is old, doesn’t mean it’s no longer useful! Look back at all the things you’ve shared (or, possibly haven’t yet) and it’s easy to see that much of it can and should be shared again. Musicians should know above almost all others that a song is a song, and its power and worth doesn’t really go away with time. The same can be said (perhaps to a lesser extent) about the rest of your content as well. While you may have an established fanbase that’s been with you since the beginning, you’re likely also getting new followers and fans all the time. Someone who just started following you last week may not know about that awesome song from two albums ago, so why not share it again? You’ll introduce new things to those just joining the party, and the fans who already know it aren’t likely to be angered by revisiting old favorites. Also, sometimes situations or events arise that allow you to seamlessly share older items. For example, if you’re going to release a new single, why not do a countdown using older singles? It hypes up the new item coming in a meaningful way, as opposed to you simply mentioning it with text every day. If you’re going to be playing a certain city, share a live photo from the last time you were there, showing how much fun you had. These are fun ways of getting people excited for something and showing you care, while at the same time grabbing more views, shares, and likes for things you thought you’d already exhausted. Even reposting a link for someone to buy your year-old album or a T-shirt with your band logo on it isn’t shameful. Again, some fans may have missed the link the first time, and if you were able to poll everyone who followed you, you’d be surprised at how many of them didn’t know you had a limited edition vinyl for sale in your online store, even if you’ve advertised it. Lastly, people aren’t always in the same stage of being a fan, so sharing things at all different times can truly be beneficial. Personally, I’ve experienced this when I discover a new band. 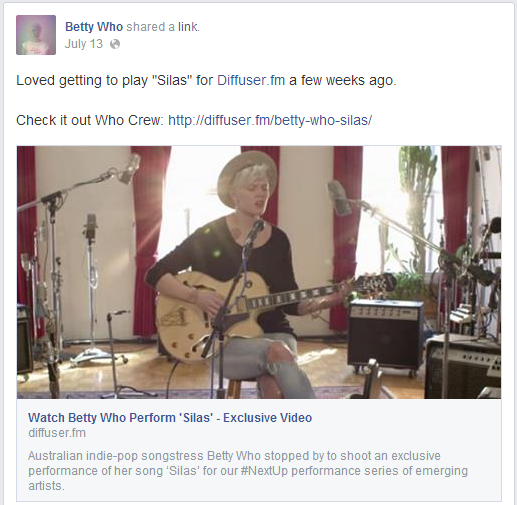 When I first heard of pop singer Betty Who, I liked her well enough, but didn’t give it too much thought. As time went on and I listened more, I fell head over heels in love. As she reminds everyone she has tickets on sale and a merch store, I now buy something almost every time, though I certainly wouldn’t have a year and a half ago. The tricky thing with social media is that you always have to have something to say or something to share. Coming up with new things all the time can be exhausting, and frankly, unnecessary. Don't be afraid of saying something twice if it's really worth saying.